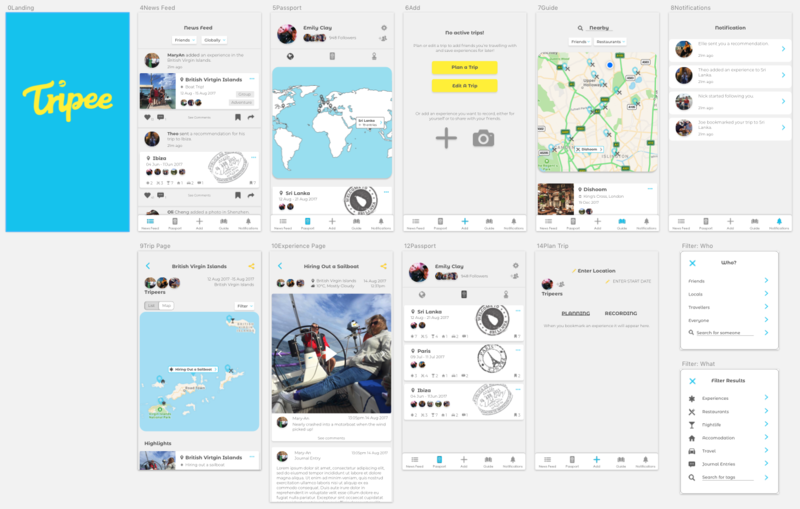 The idea for this project started off as a social media app for travelling. The millennial generation is known for placing a high emphasis on being unique, and a major part of that is growing their identity through culturally rich experiences and exploration of the unknown, both of which travel provides in full. Millennials are the largest generation in history, and by 2025 millennials and younger generations will account for 75% of all consumers and travellers. 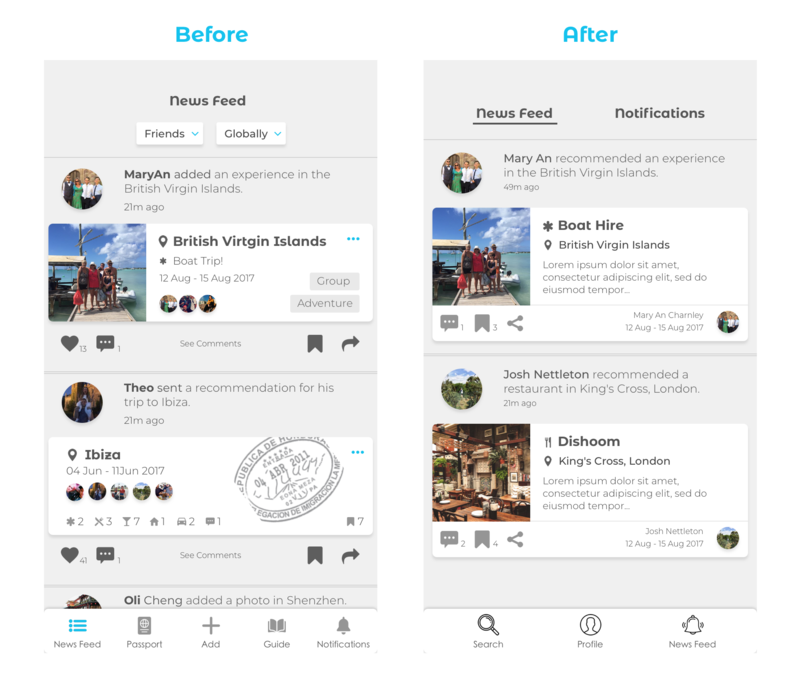 How might a social media platform for travel experiences function? What would be the core user experience for young travellers? It was important to think contextually about the experience using the app - Is the user travelling, planning a trip or simply browsing what their friend is up to? How will experiences be recorded, shared and discovered? These are the questions this project aimed to answer through empathising with millennials and their needs, wants and pain points for travelling. 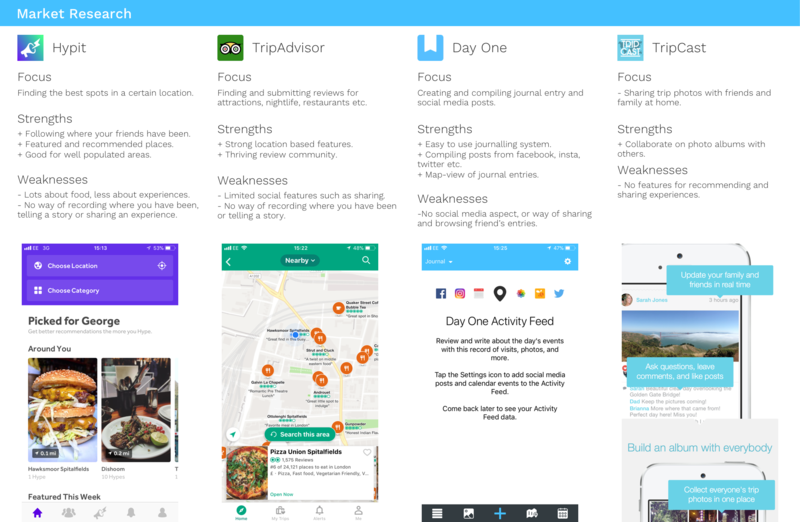 The usability test of the first prototype resulted in a pivot of the app, with a shift in focus form travelling to recommendations. It was found that the benefits for travellers could be retained while simplifying many other elements of the app and catering to a wider group of users. To understand the current platforms available for recording, sharing and discovering travel destinations and experiences. To empathise with those who travel frequently and understand how and why they currently discover, share and record their experiences. It will also be important to understand their needs, wants and pain points both while out there travelling and when interacting with digital platforms. Identify market opportunities for a unique experience and functionality through user research and ideation. 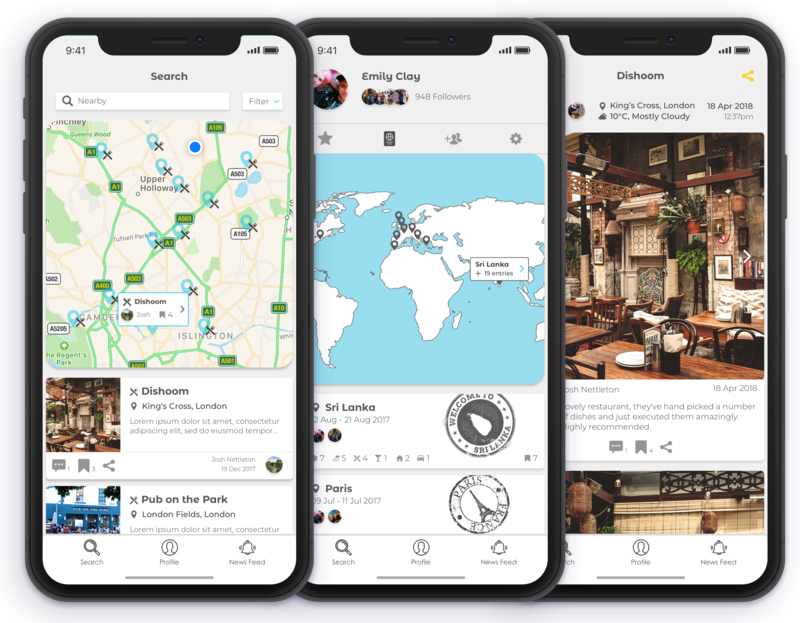 Currently there are apps dedicated to recording travels (Day One, Tripcast) and apps for recommendations / reviews (Hypit / TripAdvisor), but there is a gap in the market for an app that caters to the needs of travellers, listing the best experiences in a certain location and enabling a conversation to be had around them. 4 participants were interviewed (3 female and 1 male), all of whom are millennials with experience travelling abroad for extended periods of time. The interview round of research revealed lots of patterns around traveller’s experiences discovering, recording and sharing details of their trip. All users had a need to record where they went and recorded their travels in a note app on their phone. These notes are often then shared with people who are interested via email, WhatsApp or Facebook Messenger, but rarely used otherwise. Most travellers also use Instagram heavily to record their travels, and had a number of stories they loved telling people. I kept notes of every place, day by day - bullet points of funny moments. More memories than I want to remember - what that person did when they were pissed, that game of volleyball, that person we met. There was no other option - It’s a quick way to write stuff down without having to think too much about it. It does a job. Notes are saved on my phone - I haven’t looked at it since I went travelling so it’s a bit pointless! [Q: Whose opinion do you value?] A: Well travelled friends, who are like minded people, same age group so they probably liking the same things, financially probably in a similar place. 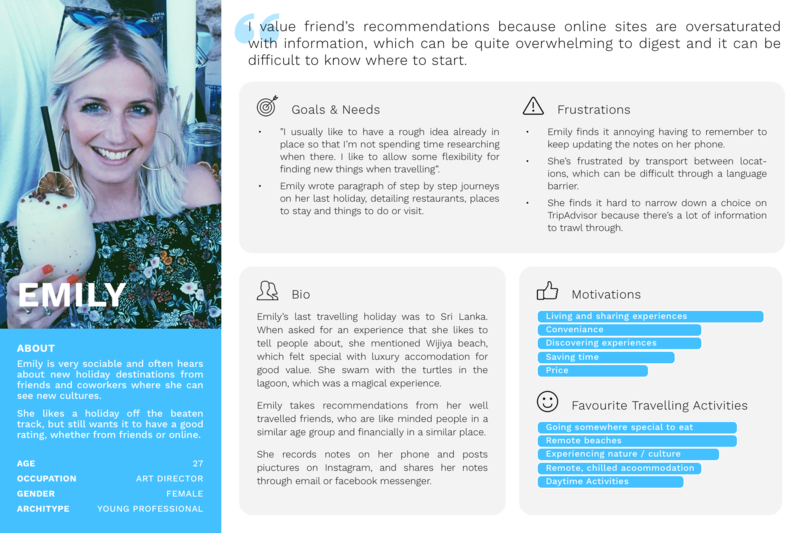 Emily, one of the interviewees, represented someone who would benefit the most from a social travel app. The persona below aims to empathise with her experience travelling. Based on the interviews, an empathy map was created to surmise the qualitative opinions of users. 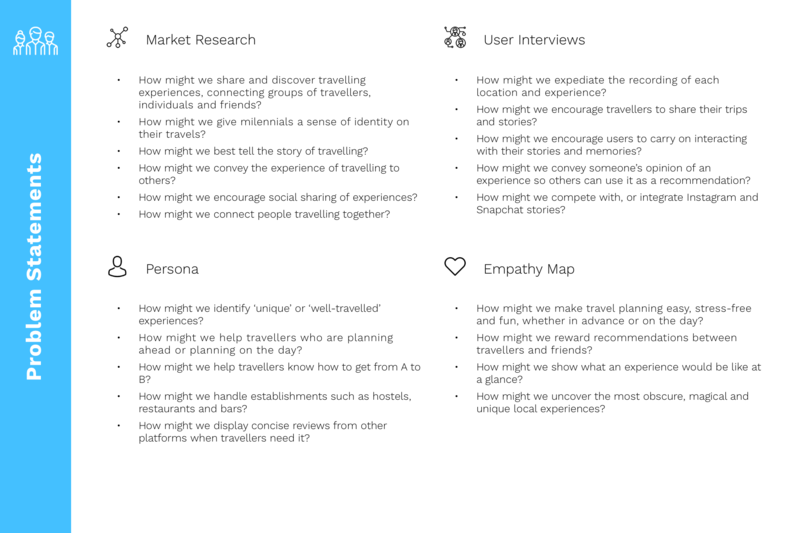 How might we share and discover travelling experiences, connecting groups of travellers, individuals and friends? How might we expedite the recording of each location and experience? How might we make travel planning easy, stress-free and fun, wether in advance or on the day? Each of the chosen problem statements was used to ideate in rapid sprints. For each statement, 5 minutes were spent filling an A3 side with 8 concepts or ideas. With approximately 40 ideas, the best of these were then storyboarded in more 5 minute sprints and developed into user flows. 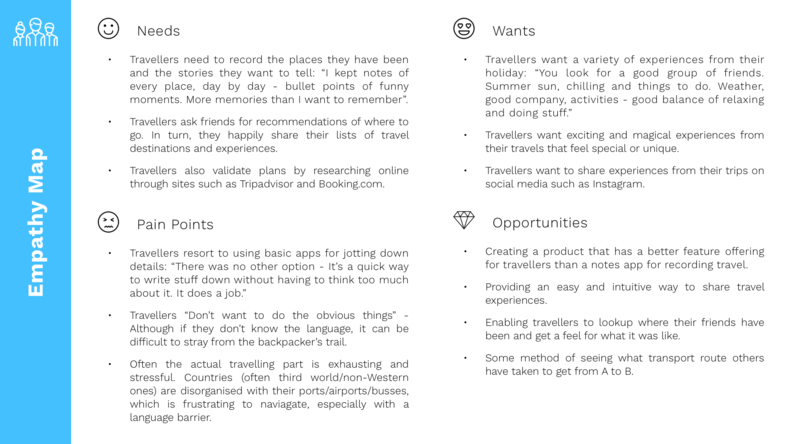 4 millennials who are experienced travellers were shown the storyboards and asked to comment on which they believe would hold the most value for them. This feedback then informed the wire-framing stage, which was put into a paper prototype and sent out to the same 4 people for review. In summary, participants liked the concept of being able to plan a trip in advance, and see a list view and map view of experiences and then mark a few of them as a particular highlight to be placed at the top of the trip profile. Another big takeaway was that the focus should be around your friends and their experiences, as opposed to a global pool of experiences. I would remove yourself from Tripadvisor. Your USP is a response to a world of fake recommendations. The internet has become a minefield of lies when it comes to recommendations. Your app is real recommendations from real people that you trust. Importing from insta is great. And whether you can save ‘favourites’ or highlights like insta does what be fun. You have all the rigour I think it just needs to feel easy for people. Ask yourself quite literal questions like ‘how easy is this for someone to fill in? How much would I want to fill in after going on a holiday? When searching for a holiday how much information would I really want?’. The paper prototype was then wire-framed in low fidelity in sketch. Unfortunately I no longer have the file available as it wasn't duplicated before being used to create the high fidelity wireframes. 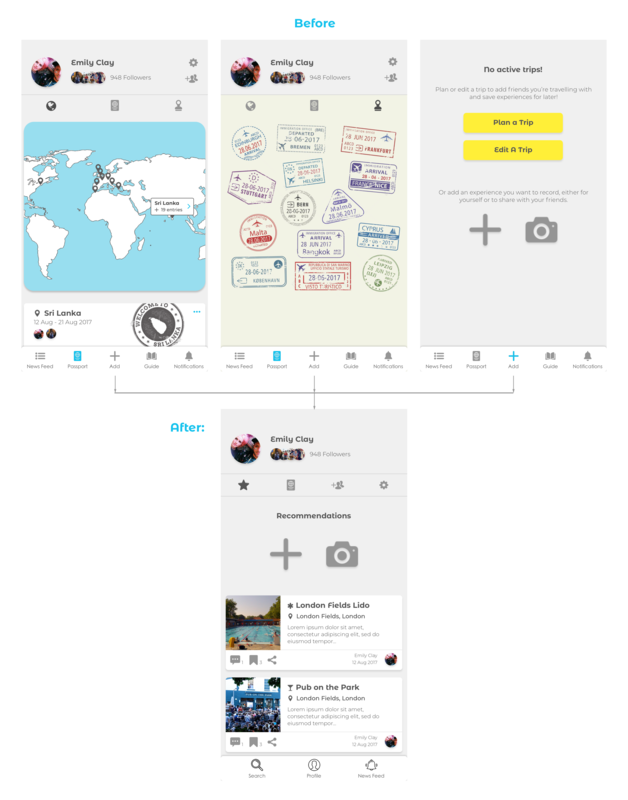 Once the layout was planned in sketch, the visual design could commence. As the wordmark is intended to be the definition or entry point of the brand, I decided to start there. The resulting wordmark featured a rounded script font to reflect the fun nature of travelling and holiday. I was experimenting with an arrow shape at the end of the last 'e', and then realised the arrow could be used in the negative. However, this resulted in an arrow pointing down and to the left. By flipping the shape and using it as the dot on the 'i', it creates a positive forward and upwards direction while implying travelling around the globe. 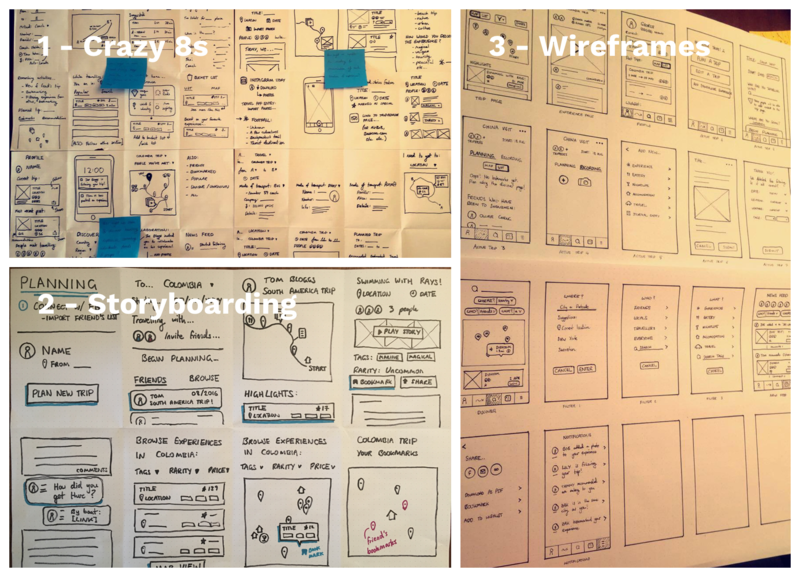 The wireframes below were the first round of wireframes created for the Invision prototype. The iconography and typography in the wireframes was chosen to reflect the logo design, which is detailed in the style tile. These error rates required a simplification of the UI. The card layout for recommendations was simplified (below) by integrating the available interactions into the card itself and grouping them together to increase their association and proximity. The guide should be a search magnifying glass and profile instead of passport. The big thing is on your profile / passport I think that's a really cool feature. I feel the focus is on backpacking and buying into that culture. I feel it needs to be simplified to cater for a city feel as well. The news feed being the first page feels too much like facebook. It's got to be a map as the central focus and then the big thing is your profile / passport. The main navigation was changed as well, grouping the news feed and notifications together to move away from associations with facebook and instagram, while also integrating the 'add' page into the profile (below). This represented a shift away from 'travelling' and 'planning trips', towards a streamlined recommendations app. By keeping the most important travel view (with the world map) and integrating bookmarks into the search page, the functionality for travellers was kept in tact. Below are the high fidelity wireframes after the pivot, which received much more positive qualitative feedback from those who had completed the usability test before. A massive step in the right direction. This project was particularly challenging as the scope of possibilities was limitless. The research and ideation phase gave plenty of ideas to work from, but when it came to putting it all together in one interface there were lots of problems to solve. After the usability test of the first prototype it was particularly difficult to decide what the correct course of action was. Only after hours of thought did I come to the conclusion to pivot on the focus of the app despite my bias towards the travelling features. Through this project I've learnt that ideas can look great when sketched out in isolation, but putting those sketches into a cohesive whole requires careful thought. Only after the prototype came together did a number of problems with the ideas become apparent.